The flag of the United States Coast Guard was officially adopted on January 28, 1964. The Coast Guard has two official flags, an ensign flag used by the Coast Guard ships and a standard military flag used at parades and ceremonies, and to represent the service. The flag being sold is the Coast Guard Standard. The flag is white with a dark blue U.S. Coat of Arms in the center and the words "United States Coast Guard" bowed across the top. 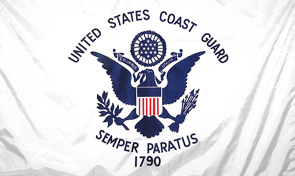 Below the eagle is the Coast Guard motto, "Semper Paratus" meaning "Always Ready" and the year 1790, the date of the Coast Guard's founding. Available in four different sizes to fit your space requirements. Select from heading and grommets only, pole hem only, fringe only or pole hem and fringe together.